Neighborhood Greenways create an excellent bicycling network through our neighborhoods. They meander mostly down quiet, neighborhood streets, where you can leisurely ride to your next destination. They also offer a unique opportunity to get to know our residential neighborhoods as you ride down the streets where people live and play. You really feel like you’re in the neighborhood, sensing its feel and personality. In fact, I explored Portland on bike using these Neighborhood Greenways when I first moved here. I didn’t know what they were called at the time, but I quickly fell in love with the bicycle route signage that helped me navigate. I thought I had arrived in bicycling Nirvana or Biketopia. But mostly, I enjoyed getting to know Portland and how each neighborhood moved into the next, but were each still connected to the whole city. 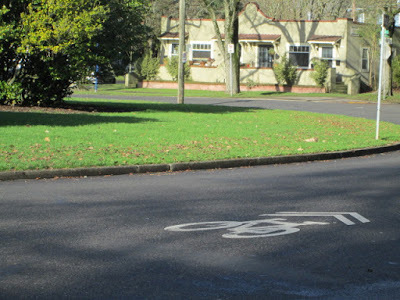 Now, the City of Portland has also added special arrow markings – called sharrows – along the bike routes to help users navigate through the routes. The Neighborhood Greenways do twist and turn through the neighborhoods because they stick to mostly quiet, lesser traveled streets. I usually take a look at a bike route map before I head out, so I have a general idea of where I’m going and if I need to find a good route off a Greenway to get to a commercial area, such as SE Hawthorne or NE Alberta. Fortunately, the signage along the routes is excellent. I particularly like that the Neighborhood Greenways wind through the city neighborhood streets. I enjoy riding with fewer cars, but also enjoy exploring parts of the city I wouldn’t discover otherwise. Sometimes I just head out and follow the sharrows to see where they take me. But I also use these routes to get from here to there for everyday tasks or for getting to work. It somehow just makes the errand or the commute more enjoyable to travel through a cozy neighborhood than on a busy thoroughfare. And who knows what I might discover along the way?